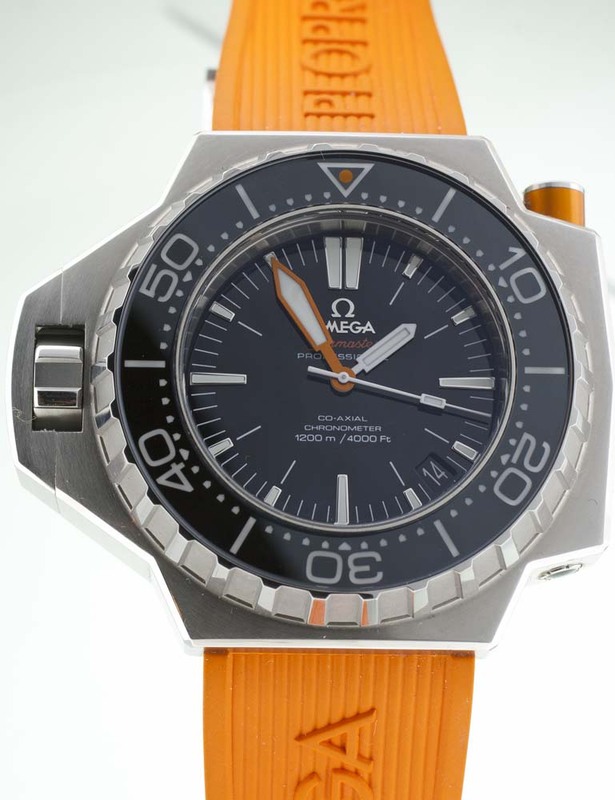 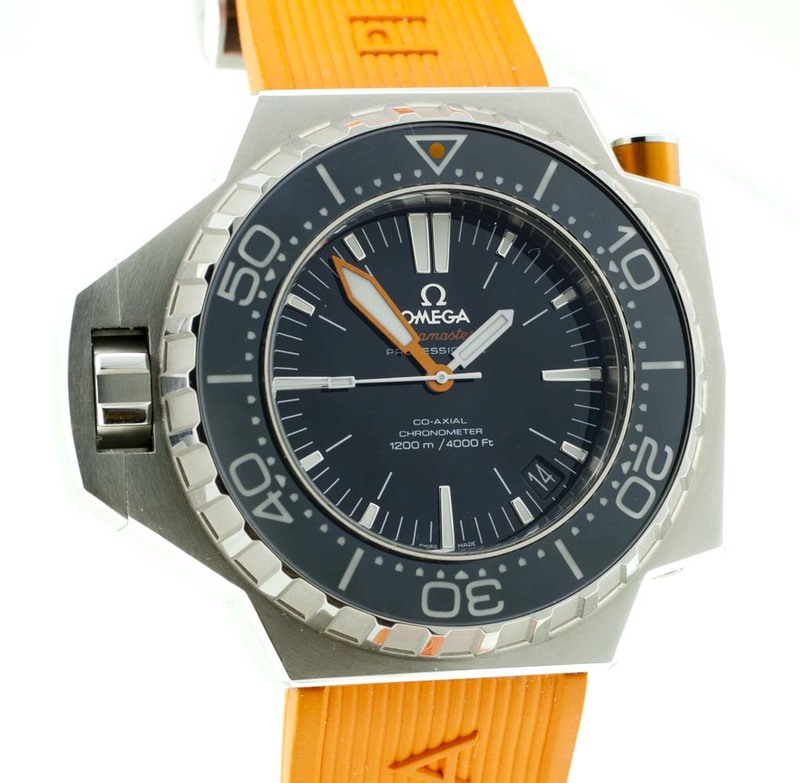 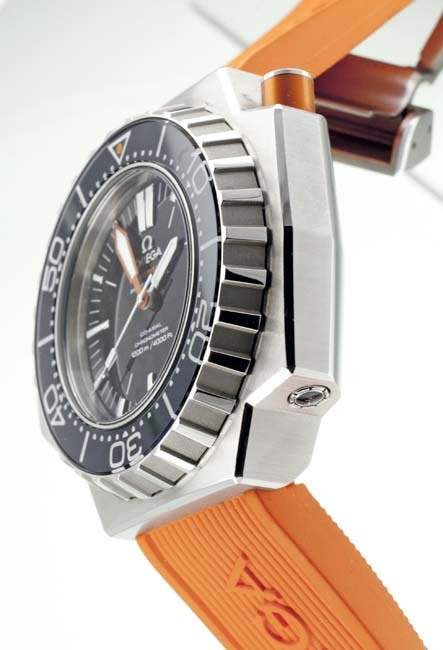 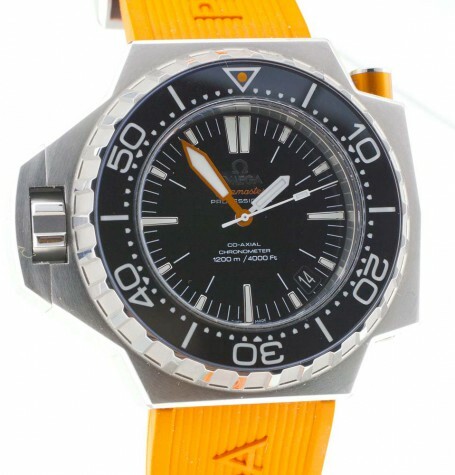 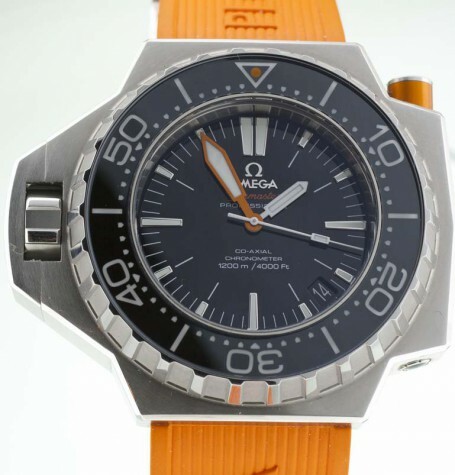 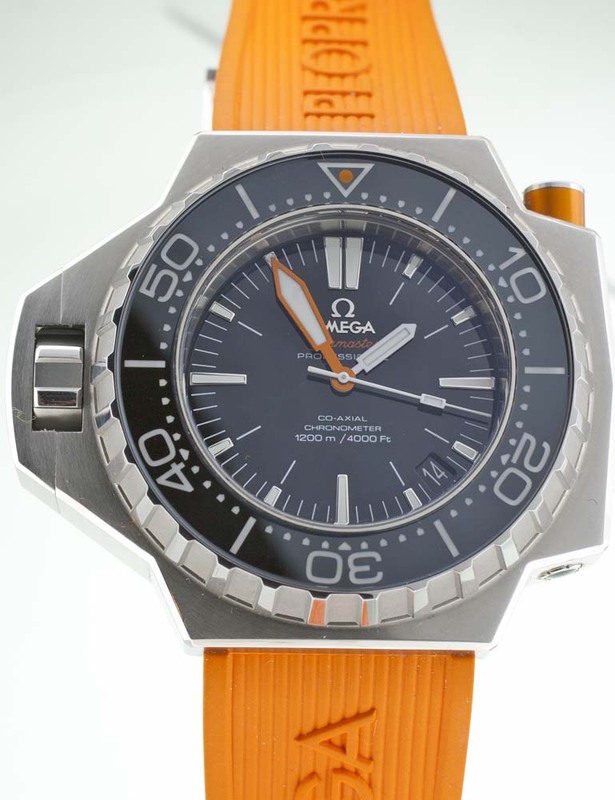 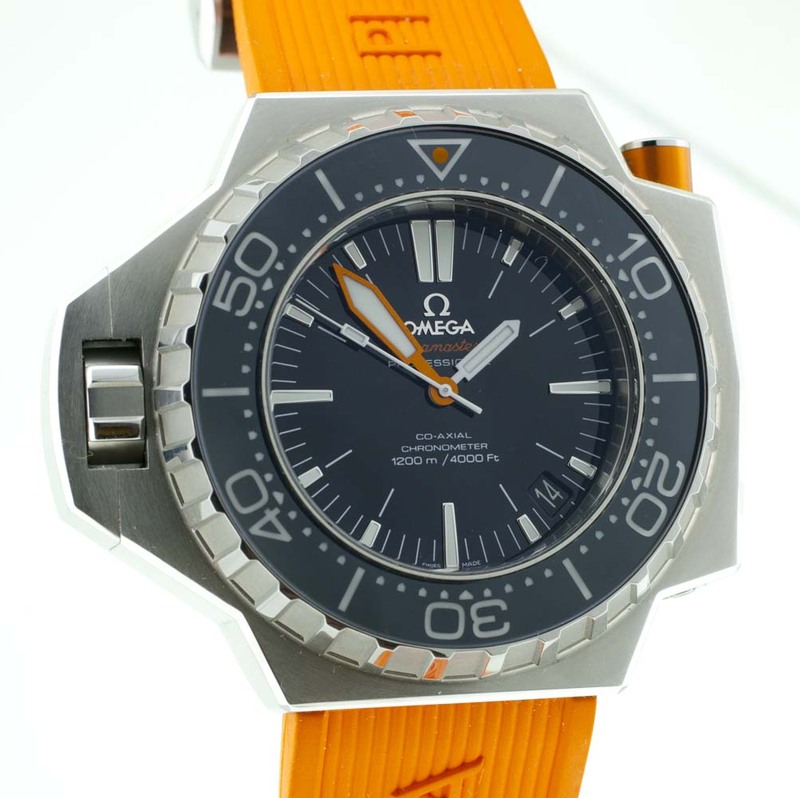 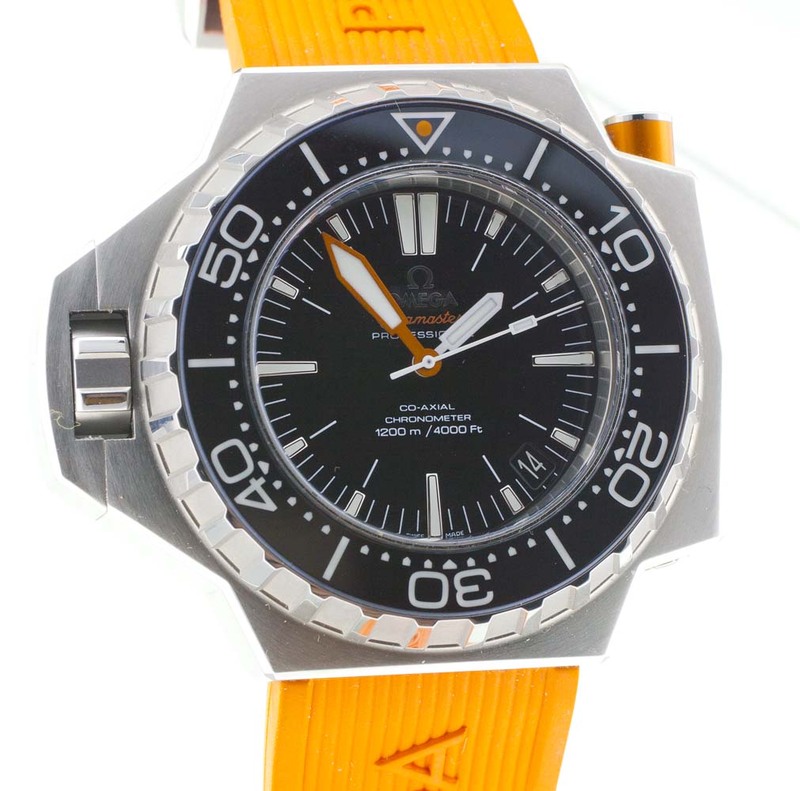 A virtually mint Omega Ploprof re-edition divers watch with all packaging, boxes, undated papers, hang tags and stickers. 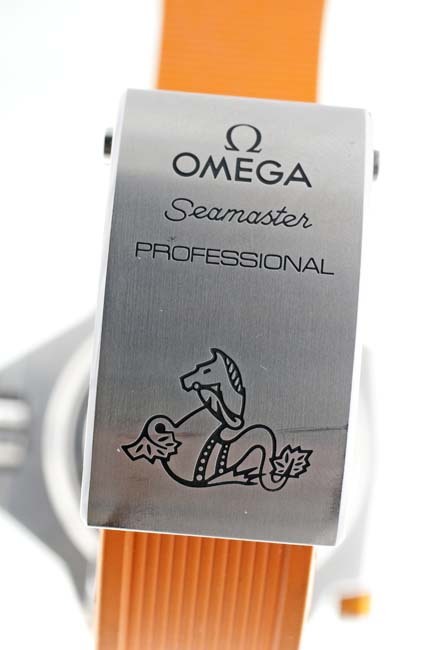 Omega Seamaster Ploprof re-edition of the famed 1970’s professional dive watch designed with the assistance of Jacques Cousteau. 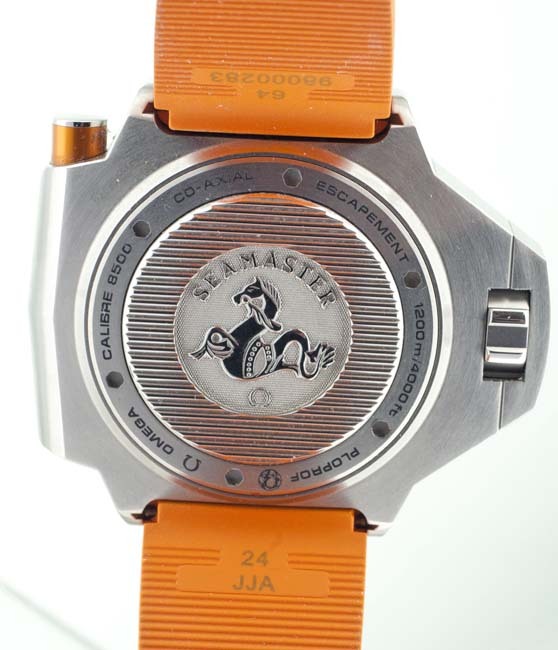 This spectacular wrist watch is less than a year old and was a an award gift to a fashion industry insider. 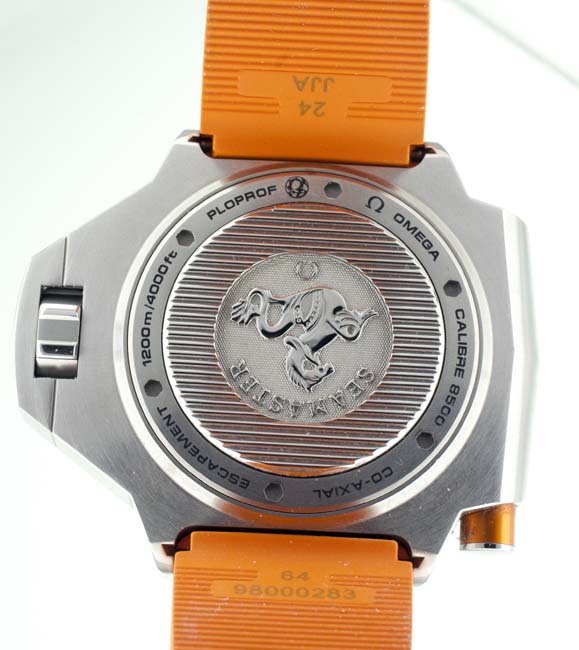 The watch comes with all paperwork, hang tags, stickers, undated warranty, double boxes and inner wrapping. 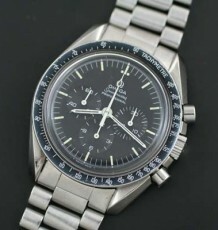 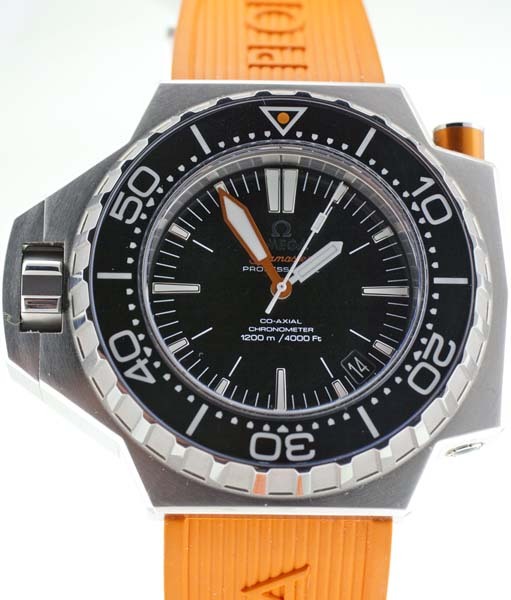 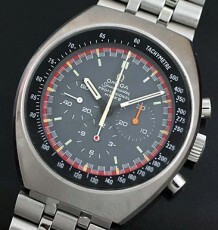 The watch carries an Omega Reference number of 22430552101001 and currently lists for over $9,400 USD. 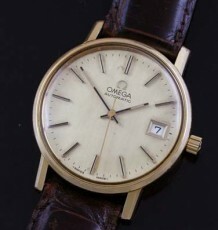 Few historical re-editions have managed to capture the essence of the original as well as this Omega Ploprof. 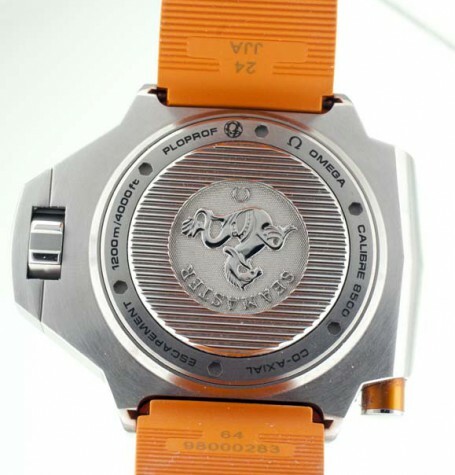 The watch is visually similar in design with the crown at 9pm and rotating bezel lock situated at the top right quadrant. 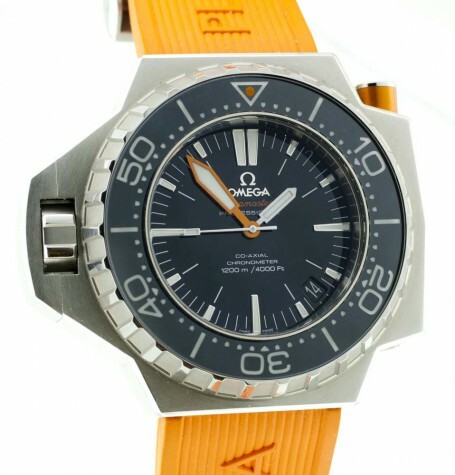 Overall the watch simply sparkles more than the original as it now features a glossy dial, sapphire bezel and a sapphire crystal, where the original was equipped with a matte dark blue dial, mineral glass crystal and a plastic or bakelite insert within teh bezel. 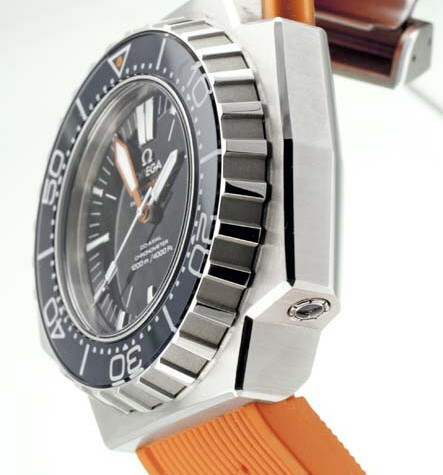 The improvements have extended the new Ploprofs water resistance to 1200 meteres, twice what the original model was rated to. 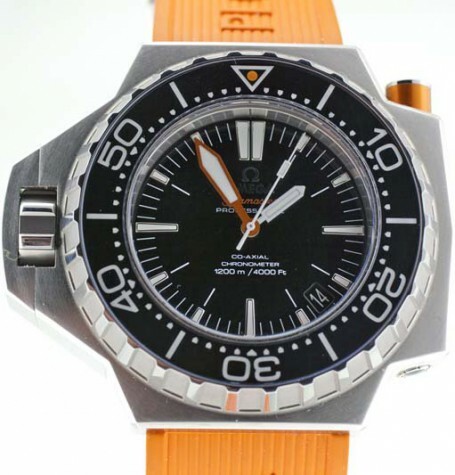 Its interesting to note that despite the universally accepted escalation of modern and improved technology on teh watch, perhaps the main reason the depth rating has doubled is likely due to the addition of a helium escape valve to the newer design. 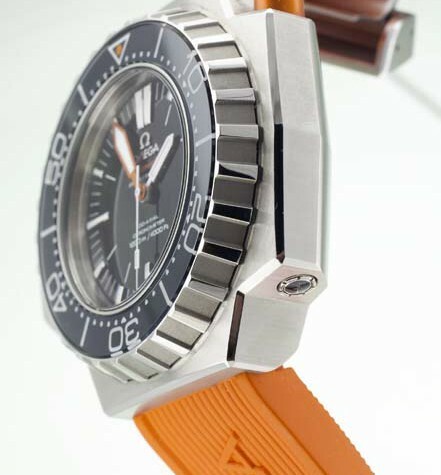 Without the escape valve watches down at serious depths have a tendency to explode off wrists as divers ascend to shallower water. 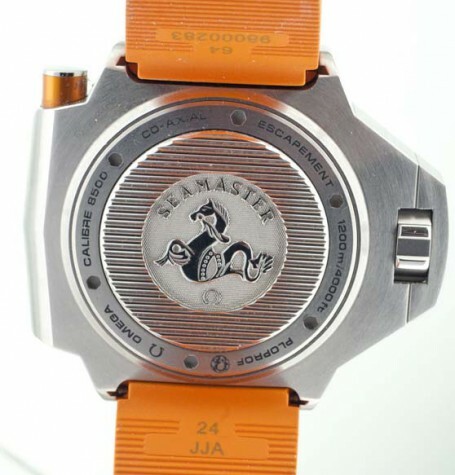 The newer model has a removable caseback for easier servicing and maintenance while the original was a monoblock design requiring the removal of the bezel and crystal to access the movement. 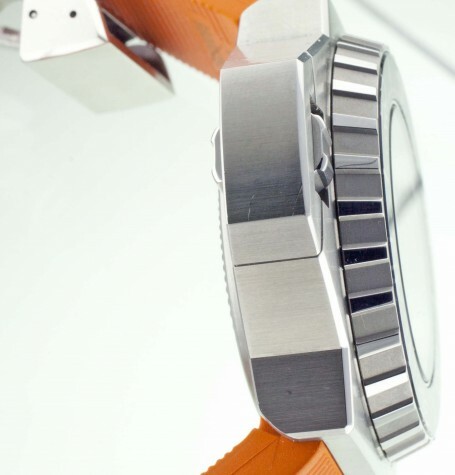 The watch is also fitted with an Omega automatic calibre 8500 movement featuring the Daniels co-axial escapement. 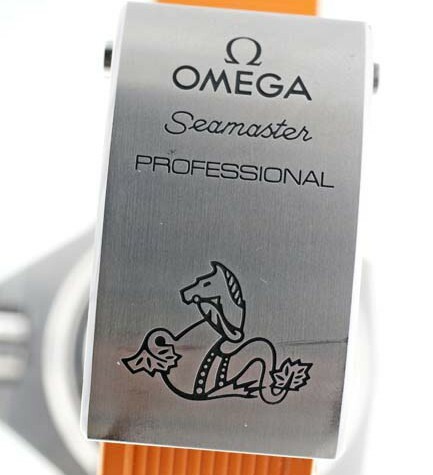 See the Omega watch site for an explanation of this impressive technology. 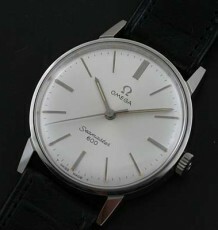 This nearly mint condition watch measures 55 mm wide by 48 mm tall. 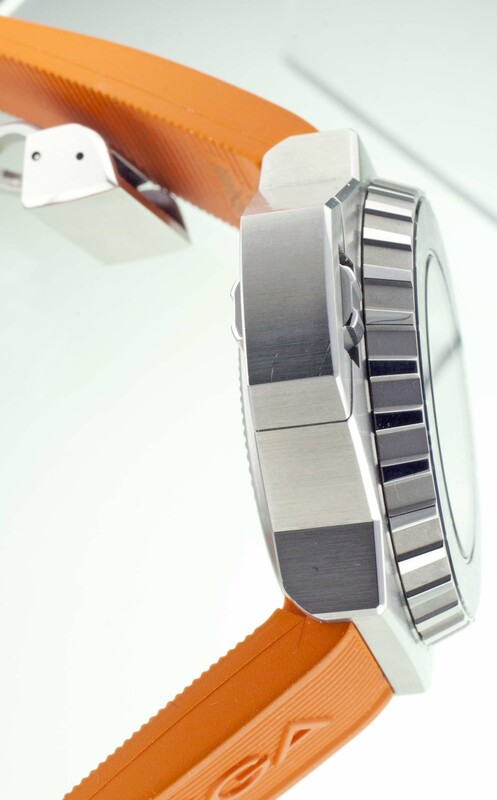 The watch is most impressively 18 mm thick from crystal surface to caseback. 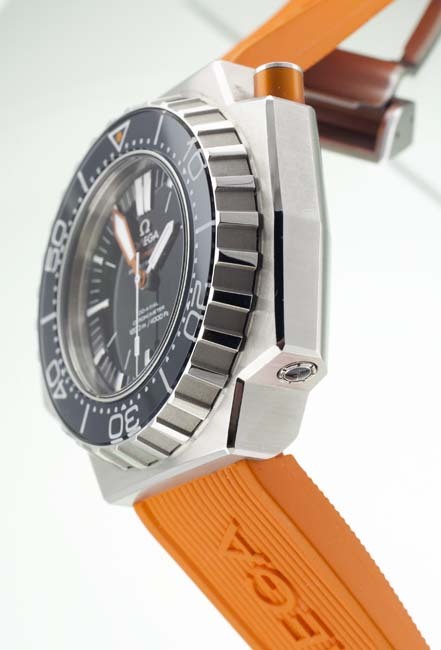 The watch comes with both the original rubber strap and the unworn shark mesh strap.